An interactive journal/quote book mash-up, featuring the authentic, heartfelt wisdom of New York Times bestselling author of If I Stay–the incomparable Gayle Forman, and accompanied by stunning full-color art. 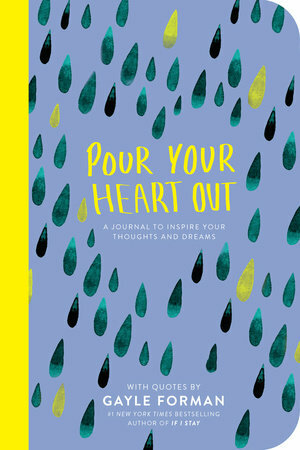 Pour Your Heart Out is part guided journal, part quote book, and your new BFF. A fully illustrated journal featuring inspiring quotes from award-winning and New York Times bestselling author Gayle Forman’s books, coupled with creative prompts to encourage self-expression and creativity. An opportunity for readers to let it all out on the page, explore their emotions, and draw on their own imaginations. Pour Your Heart Out makes the perfect companion for any teen or adult. Whether you’re off on a new adventure, dealing with tough stuff, or crushing over your lab partner, Pour Your Heart Out will be there for you through it all!